On February 8th 2016 we enter into a new Chinese year (year 4714th within the Chinese calendar) the year of the Yang Fire Monkey, Bing Shen, and I am sure there are a few Oxen who will be glad to see the back of 2015. The 2016 Xuan Kong annual flying stars full evaluation is detailed as below and this year is very important as we have the very inauspicious #2 black Star (Ju Men) enter the centre and specialist cures will be needed more than ever as this star can cause problems with the stomach, digestive system, general sickness and problems with thought process and not wishing to sound too pessimistic but there is also a good chance of another recession with a stock market crash or correction. I am a firm believer in the power of the mind and what you say can come true though I do feel a responsibility to share my thoughts especially as over the last 17 years we have always been accurate and we predicted with 100% accuracy the last recession back in 2007 although I am more than happy to be proved wrong with this one as I and most other people would rather this did not happen especially as it just feels we are coming out of the last one. The last Yang Fire Monkey years (Bing Shen) were in 1956, 1896 and 1836 and each of the years were disastrous financially and politically and this year very special cures and enhancers are need more than ever. In 2016 we have the #2 black Star (Ju Men) visit the centre earth palace and it is a very inauspicious star and can cause disasters relating to political stability throughout the world and predicted stock market crashes/corrections amongst many other problems. Yikes, that sounded really downbeat but I cannot say it any different and for those that know me, will know I always write as positively as possible but is better to be forewarned and prepared although you must do your own research as we may be Feng Shui experts we are not financial wizards. For the past 18 years we have worked with tens of thousands of financial institutions and individuals making Feng Shui predictions on economics and are rarely wrong so please take care with investments in 2016. Please spend wisely and of course make sure you place your Feng Shui annual cures and enhancers as this will help lessen the effects and turn a bad year into a good one but of course we are not financial experts so we can only advise from a Feng Shui aspect so please use your own due diligence with your investments. Personally I am coming out of the stock market and investing in gold, silver and property and also in young mining companies as earth business like this are looking good in the yang fire Monkey year. The last two Monkey years were in 1992 and 2004 which sadly saw Asia devastated by a tsunami killing 200,000 and a large earthquake taking lives in Turkey so the likelihood of another disaster in 2016 is highly likely especially with America and Russia, ISIS in Syria and Iraq in conflict already although the good news is from a Feng Shui aspect 2016 should see a resolution more long term which is what the world needs. Fire Monkey years favour growth and creativity and a lot of progress will be made around the world this year with more developments concerning space and innovation taking place. A lot of focus will be placed on the US election during the year of the Yang Fire Monkey and there will be a lot of talk on national and foreign policy which will see a lot of promises. This year should see some dramatic currency instabilities and even possibilities of a market correction although this can be a year for growth and can see a lot of new technology and inventions as the year of the Monkey goes on. 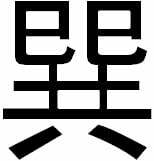 In traditional and authentic Feng Shui, we use the solar calendar and on February 4th 2016 we have the #2 black Star (Ju Men) visit the centre earth palace that can cause bad luck, sickness, fire related incidents, political instability, contagious disease to do with the stomach or any illness caught airborne which will mean that 2016 will regrettably not be a steady year and potentially there could be many problems again in the Middle East. We will still experience hostility around the world like last year and predictions of natural disasters like earthquakes; landslides, floods and further worldwide disasters are highly likely along with scandals from large corporations. Tai sui enters the southwest Kun palace and combined with the #8 star affects the Matriarch (eldest female). We last had a Yang Fire Monkey Bing Shen year was back in 1956 and this is actually a cycle of 60 years which will be found in a traditional “ten thousand year calendar” or our Tong Shu 2016 software. This year, there are more bad months than usual and it is very important that we treat the area for the year to lessen the negative effects of the monthly visiting stars in February, April, May, August, October, November 2016 and January 2017. The #2 robbery star is trapped in the centre from 4th February 2016 and this can cause difficulties for a home and business and specialist cures and enhancers are needed and of course our annual 2016 cures and enhancers kits allow for this, we have put together a very powerful kit where there are some very special talismans and charms included in the kits as standard as they are crucial to be placed this year. We have also published our 2016 Feng Shui guide along with our personal on-line report which is filled with customised information to each different person. Those born in the year of the Tiger could be affected by the conflicting influences of the year of the Monkey. Although the Tiger is the conflict animal of the Monkey year, those born in the year of the Tiger should be aware of potential difficulties they may encounter during the year and take extra care in whatever they do without taking unnecessary risks. Regardless, if you follow the advice here you can avoid many problems, in our opinion so do not panic. It should be noted that there are five different types of each Chinese Animal (fire, water, wood, earth, metal) which depends on the year you were born and each different animal will have different predictions for the year ahead; you can find out more about this in our 2016 Feng Shui guide. The degree of this influence varies from one person to another. One of the major considerations is the heavenly stem of the year in which one was born so if you were born in 1926 or 1986 which would be a Fire Tiger, the year will not be bad at all. With regards to Xuan Kong flying stars we have the #5 yellow – representing bad luck, obstacles and misfortune, arriving in the northeast on February 4th 2016 along with Sui Po it is recommended that you place a salt water cure, Yi Fan Feng Shun protection and enhancement charm, six rod hollow metal wind chime and a row of six coins tied with red ribbon to dissipate this negative energy. The worst months will be February, April, May, August, October, November 2016 and January 2017. Another bad star # 2 black, symbolising sickness will arrive in the centre in 2016. The traditional method to dissolve this 2 is to hang a row of six metal coins and a salt water cure in the centre of the home or business. The Grand Duke Tai sui this year is in the southwest, hence it is not favourable to “move earth” or make substantial construction work in this direction. The very negative robbery star #3 is a star of conflict and sadly this is located in the northwest and very special cures are needed this year to avoid problems; for the #3 star, we need to place a Long Zhui Zhenzhu Coiled Dragon statue along with a Long Yu Quan Bi enhancer in this area. There are many good and bad aspects to the year and you can find everything you need on this page to make sure you avoid many problems. In 2016 the forecast for the Tiger will have its downsides during the year of the Yang Fire Monkey but please bear in mind that this is only one small influence in the big scheme of things in life. 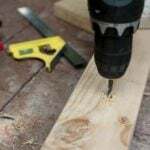 Things can turn out well despite this if you turn your attention to the monthly forecast on the energies of the space you occupy in your home and office in order to soften predicaments. The positioning of the flying stars for the year has some good and bad areas in 2016 although we will still need to put the relevant Annual Cures and enhancers in place to negate these undesirable influences from being activated by visiting monthly unfavourable stars. The palaces to be aware of are the southwest, south, northeast, northwest and the centre. Avoidance and disturbance of these areas is always the best cure but in the majority of home and offices, we are not all blessed with the option to abandon a room for the year which is why we have included the appropriate annual cures and enhancers below for the Flying Stars of 2016 within the individual palaces making the areas manageable and usable. Please do not fret if your bedroom, office or other important rooms are located in the southwest, south, northeast and northwest this year; if you begin to prepare placing your 2016 cures and enhancers kit to ensure a trouble free year, and of course make sure you sign up for our free monthly newsletter so you are kept up to date with the monthly flying stars giving you even more control of your destiny. I would also advise making sure that you give your home and office a deep clean before the year of the Monkey begins and be sure to cleanse all of your old Feng Shui Cures and Enhancers to remove any negative Qi. One other way is to make the most of the year of the Monkey is to use our annual 2016 Feng Shui Guide. This book is exceptional and has been skilfully and meticulously written and translated to ensure you a good year in 2016, year of the Yang Fire Monkey. This book contains over 490 pages helping you make 2016 as prosperous as it can be. Look for the links below for more details. 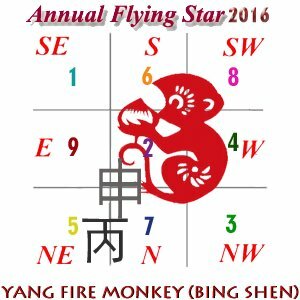 The 2016 annual flying stars Xuan Kong full analysis is detailed below for the year of the Yang Fire Monkey. 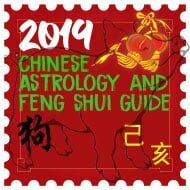 Please do not get confused with solar (this is when you place Feng Shui cures – spring begins) and lunar (celebrate Chinese New Year) calendars, more on this below. 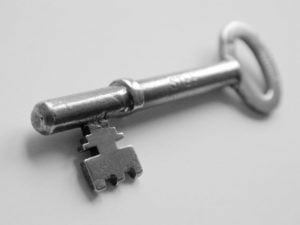 Over the last eighteen years around Chinese New Year (solar) we select a very valuable and crucial Feng Shui cures and enhancer’s kit of little known Feng Shui cures and enhancers that can be placed at any time of the year although I would advise placing them earlier in the year for full effect. Many of these cures and enhancers we are using this year are very tightly held secrets in the world of Feng Shui and although many websites have tried to copy them from us, they do not get the ingredients right and this has been proven over the years to cause problems where the inscriptions and materials of the Cures have been changed or left out and have had adverse effects so please be careful that you make sure the company you get your Cures from are not just about the money and actually have a real passion for Feng Shui; we see far too many companies trying their hand at all different things and causing some very bad results. The 2016 Feng Shui cures and enhancers annual kit is not just some gimmicky cures put together; every one of these Cures are extremely powerful cures and enhancers that only the most advanced Feng Shui Masters and consultants throughout the world use and quite a few of the cures in our kits are one that many Feng Shui Masters charge thousands of pounds for. It does not matter how late in the year in 2016 you place your annual cures as we have many clients who have placed their Cures near the end of the and still got great results and still receive orders in January for Cures for the current year. Are you really prepared for what could take place in 2016? 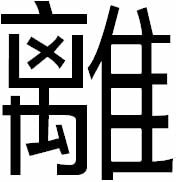 Finances could be a problem in 2016 as Yang Fire Monkey years can bring about financial instability but if you use the Ch’u Men Chien Ts’ai in the southwest and the Sheng chi enhancer in the southeast, in our opinion you can help change the good to bad when it comes to wealth and luck. There is going to be many good parts of 2016 to enjoy and if you follow the advice below, in our opinion you CAN AVOID many problems and this is the reason why we introduced our annual cures and enhancers kits way back in 1998 to help you avoid many of the problems that come with certain Flying Stars. There will be a great deal of Feng Shui Masters and consultants predicting disastrous events around homes and businesses all over the world that will take place in 2016 and general bad things for the year but despite what they are predicting, I am very much looking forward to 2016 and so should you; it is not as bad as they say and if you follow the advice below you can help avoid many problems. Surely the 2016 cures and enhancers will make you exempt from any problems? If your bedroom is in the southwest, northwest, south or northeast and you do not exercise much, smoke, eat takeaways every night, drink heavily and overall a bit lazy and think that taking a vitamin C tablet at the end of the day will cancel all of the above from your body and mind, you are very much mistaken although I know you do not need me to tell you that. Please do not think I am standing on my high horse being all righteous and perfect, far from it and I will once again be making changes to my lifestyle in 2016 and cutting out certain comfort foods and aiming to get some more exercise (the older i get the more i have to make, who can relate to this? 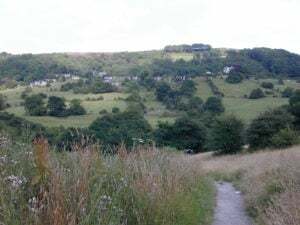 ); Last year I moved home about 5 miles from the office and said I would be cycling to work as much as possible; admittedly, this happened maybe around 40 days of the year although I have been walking a lot more lately in order to keep myself active and cut down on pollution. I am just giving you this advice as I have worked with thousands of clients throughout the world and I know the outcome. I am not coming from a moral high ground here and as hard as this may sound, you will, I guarantee have some problems in 2016 although if you make the relevant changes this year, you can help avoid many of the potential problems and some of them will not be as bad as they could have been if you did not make any changes, placing just the Feng Shui cures and enhancers on their own will help immensely but you should also make lifestyle changes; finances will require care this year and if you think that you can place the cures and go and spend a big sum of money straight after, you are mistaken; Feng Shui cures work to protect, dissipate and enhance areas of your life. 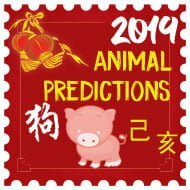 If you would like a more precise plan of how to personally make the most of the year, after you have gone through the 2016 Annual Flying Stars, take a look at the 2016 Chinese animal Predictions and the 2016 Tong Shu Almanac and Chinese Animal Book or maybe consider our Feng Shui report which gives you completely personalised details. As you may already know, we have given this Feng Shui advice to hundreds of thousands of different Feng Shui Masters, Practitioners, students and enthusiasts for over 17 years now and although we make many suggestions on cures and enhancers we do not always agree with many websites insisting that you have to spend hundreds of pounds each year on cures and enhancers as they are not always needed which is why we always advise different types of Cures so that those who cannot afford to purchase Cures and Enhancers can still benefit from simple changes such as colours and objects which I have written about below; the Feng shui Cures and Enhancers can make a huge difference this year and when used alongside colours, shapes and objects, the results can be fantastic although if you cannot afford these Cures there are still alternative options. There are two products that I would strongly recommend to you for 2016 which, are our 2016 annual cures kit and the world’s most powerful and most widely used Feng Shui 2016 software, which has had over nine years in development, over 50 combined years Feng Shui experience and one year of beta testing with Feng Shui Master’s, Practitioners and students from all over the world, Michael Hanna and the International Academy of Feng Shui have built the most powerful Feng Shui software available. 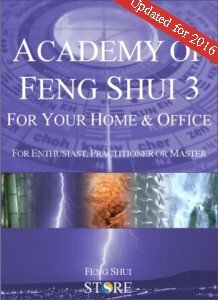 This software is used by thousands of Feng Shui Master’s. Practitioners, students and enthusiasts from over 118 different countries throughout the world. What should I do if I have last year’s Cures and Enhancers kit? We have a lot of people email us asking what we personally do with our Feng Shui Cures and Enhancers at the end of each Chinese New Year, as nearly all websites and book state to dispose of the cures at the end of each year although our circumstances are very different to yours as we have thousands of these cure and enhancers in our warehouse. The cures that we have never changed or replaced is our Wu Lou which is now 26 years old, metal Pi Yao, three legged Toad God or Tsai Shen Yeh and we cleanse these at the end of every year to rid them of any negative Qi they have accumulated over the year. We change our wind chime and shou shan stone Pi Yao every year, the salt water cure we change without fail each year and I must admit the six Chinese coins tied in a row with red ribbon we always change and our Ba Gua mirror yearly as these are very bad to keep for too long and the reason why we will never sell plastic or metal Ba Gua mirrors as they do not age and store so much negative energy and will cause you many problems. You must never use a plastic or metal ba gua (pa kua). 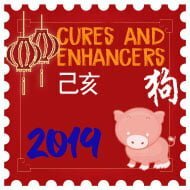 Certain Feng Shui Cures and Enhancers could last you a lifetime although there are some Cures and Enhancers that simply must be replaced every Chinese New Year. 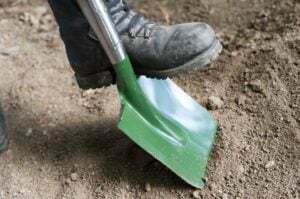 To cleanse your Cures and Enhancers, ideally you should place outside under a full moon overnight or in direct sunlight for at least 4 hours and sprinkle with rock or normal salt. Make sure you rinse under water (don’t forget to dry them) in the morning and you should place them in the appropriate areas as detailed below. This does not apply to the salt water cure, as these MUST be renewed every year without exception and must never be reused. As with all our products including the annual cures kits, they are all cleansed of negative energy and empowered with positive Sheng Ch’i energy, which makes them so much more effective. As with all of our products including these annual cures kits, they are all cleansed of negative energy and empowered with positive Sheng Ch’i energy, which makes them so much more effective. Every single Cure and Enhancer that we sell is cleansed before leaving us and is handled with care when we send them out. My advice to you is that even if you have our kit from seventeen years ago, you can carry on using it but please follow the advice above about cleansing and make sure the salt water cure (must replace) six rod metal wind chime and six coins in a row tied with red ribbon are replaced as these hold a lot of negative energy and can cause problems if kept for too long and disturbed. A general rule of thumb is to dispose of your Cures and Enhancers if they are chipped, broken or worn out. Please never throw your Wu Lou or wealth ingot away as these are specially made for us and are the correct weight and size and I think they are a work of art and extremely powerful. I cannot afford to purchase these cures or enhancers this year and/or my partner does not believe in Feng Shui? Usually, when someone first hears about Feng Shui, they usually think their home will have to look like a Chinese restaurant and cover their home in waving cats and large dragons covering half their wall to obtain Good Feng Shui which is certainly not the case. If you do not want to have six Chinese coins tied in a row with red ribbon or a Wu Lou beside the bed there is always an alternative. We have a lot of clients who place their 6 coins in a row behind a picture frame if they do not want it on display. 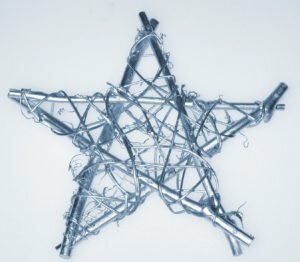 For the northeast and centre of your home or office, you should use some good quality heavy metal ornaments during the year of the Monkey which should be round shapes as this represents metal but avoid menacing looking ornaments like metal knives or similar or anything that is aggressive looking with sharp corners. Although it’s always best to have the Cures on display, I have many clients who place their 6 Chinese Coins tied in red ribbon behind a photo on the wall and still get tremendous results. An alternative to a salt water cure in the northeast and centre in 2016 is a bowl of ultra clean, still water although this is not as powerful as the Salt Water Cure and needs special care so it does get stagnant or get covered in a layer of dust and bugs. The water must be kept squeaky clean otherwise it will cause you many problems. I do not always like to recommend using a bowl because they can get dirty especially if you live in a hot country and can cause many problems, so please be careful with this if you do not use the salt cure. In the southwest and south, try to place some real quartz crystal from the 4th February 2016 or objects that are made from an earth material like ceramic and make sure they are square in shape as this represents earth, this will help enhance wealth and luck in your home or office in 2016. The most influential and imperative cure and enhancer in 2016 is called a Ch’u Men Chien Ts’ai Master cure this cure can only be used in Yang Fire Monkey years. The last time this powerful cure would have been used was in 1956 which was also a Yang Fire Monkey year. This cure is needed to enhance and protect the occupants of the home or office in 2016 especially for the female of a home or business. Take a look at our 2016 annual cures kit and be as imaginative as possible in creating your own kit. 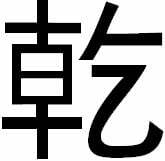 Flying star (Xuan Kong) Feng Shui is the most powerful form of Feng Shui that most professional Practitioners use; it has absolutely nothing to do with astrology. Flying Star Feng Shui is an analysis of the five elements, land formations and star combinations that occupy your building and is not just limited to the home; I have consulted on farms, restaurants, universities, complete high rise buildings and much more. Every Chinese New Year sees the annual stars change, bringing good and bad energy to different sectors of the property. For the last 17 years, we have been giving accurate information on the Monthly and Annual Flying Stars offering free information on how you can weaken, neutralise or enhance the different areas of your home or office. Every single building throughout the world will have these changing annual stars and you will need to take into account their ability to cause harm ranging from, sickness, wealth problems, legal problems, gossip, relationship problems and just overall bad luck but the good side is that the Flying Stars will also bring auspicious good luck in wealth, health, romance, education and overall good well-being. Flying Stars will always have an effect whether people believe in them or not so please take this in to consideration for friends and family. Unless an auspicious star is activated in the home or office, it is of no benefit to you so follow our advice carefully. Flying Star Feng Shui Is extremely powerful and can explain a lot about what is going on in a home; when I visit a client for a consultation, I make sure that they do not tell me anything about their life as the Flying Star Chart can tell me all about their life. 2016 is the 4714th year of the Chinese calendar. Due to time differences around the world, the first day of Spring will fall what appears to be a day early in some countries. In China, the solar calendar of the Bing Shen (Yang Fire Monkey) year starts on 4th February 2016 at 17:46. In GMT, the new solar year starts on 4th February 2016 at 09:46. The Fire Monkey year ends February 3rd 2017. Chinese New Year falls on February 8th 2016. The first day of the Hsia (solar) calendar is February 4th 2016, this is the day you would place your Feng Shui cures and enhancers. Chinese New Year falls on February 8th 2016 (Lunar calendar). This is the date you celebrate the Chinese New Year with Ang Pow, fireworks Talismans etc and not the date you use to place cures and enhancers in Feng Shui. For more details on 2016 Chinese New Year click here. 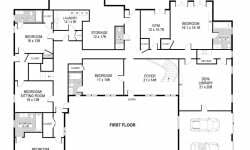 The first thing you will need when planning the compass sectors of your home or office is a floor plan of your home or office. 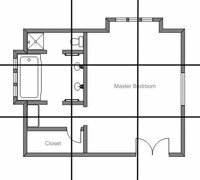 Ideally, you will want the original architects or estate agents plan but you can still hand draw this but it should be more or less to scale but don’t worry if it is not, it will give you a good idea either way. Define all the interior walls that indicate the different rooms. 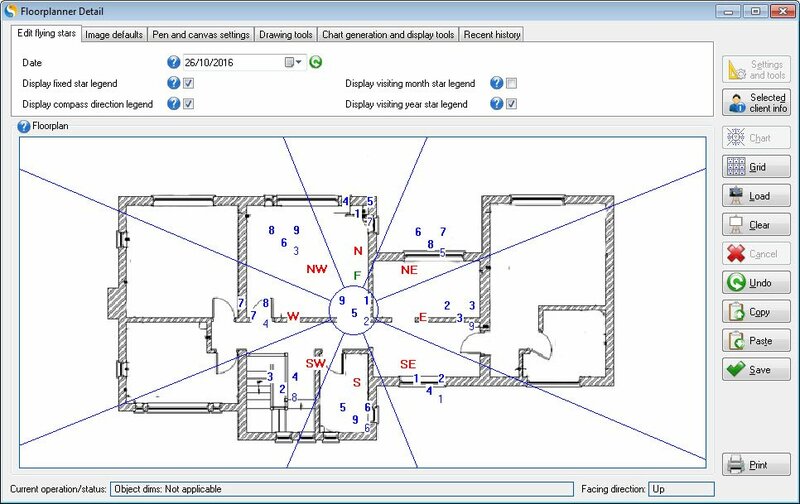 If you have our Feng Shui Software, you can actually do your own floor plan within the software which makes it very easy. Secondly, you will need to divide your floor plan into 9 equal grids like a tic tac toe board or wedges in proportion as shown below. Next, you need to know the compass direction of your home or office. If you need help with taking compass readings please visit this page. After you have taken your compass readings; you will know which wall is in which direction and you can then overlay the year’s Lo Shu grid (annual stars) according to the eight magnetic directions. 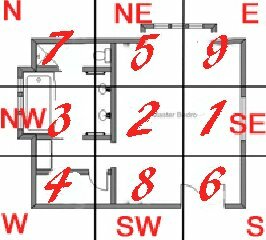 So in 2016 you will see from below that the #5 star falls into the northeast area for this home, which in the majority of homes will fall in to either a bedroom, kitchen, study or living room and could cause problems if you do not place any cures. I know this will sound like a hard sell but our Feng Shui software does do everything for you ensuring that no mistakes are made. This chart below was created with our Feng Shui software Floor planner section. 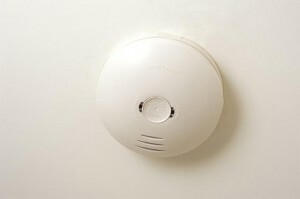 The top left number is called the mountain star and affects health and well-being of the occupants in the home. The top right number is called the facing star which affects wealth. The middle number is called the period number and comes from the year the home was built. The bottom right number is the 2016 flying star. At a glance you can see where all the annual stars are along with mountain and facing etc and the reason why the software has become the industry standard in Feng Shui. The chart below is actually a very special chart called a “combination of ten with sitting” and requires careful analysis and the software explains in great details of how to get the best of every home of any age in any part of the world facing any direction. When at work, you may sit facing the south direction only if this is one of your personal good directions, if not, please do not sit with your back to the south in 2016 or you may find yourself coming in to contact with unscrupulous people working against you or you may encounter undue gossip and back stabbing during the year. A very powerful cure and enhancer for the south this year is to place a Hotei Buddha. The Hotei can help avoid a lot of problems that can be brought on when the Three Killings visit the south. The Hotei Buddha really is a beautiful and powerful cure especially as it is one of the most traditional cures in Feng Shui. Resides between 232.5º – 247.5º degrees southwest in 2016. Like the Three Killings, Tai Sui does not like to be disturbed either. The effects of Tai Sui can be good or bad depending on the annual flying stars that coincide with its location. The traditional Chinese method to appease Tai Sui is to place a Guan Zhong Tai Sui plaque to pay respect and appease the Deity. By paying respect to Grand Duke Jupiter, we can weaken or avoid the problems this can bring. This is really important this year and we have included the Guan Zhong Tai Sui Plaque in all our annual cures and enhancers kits. Sui Po year breaker occupies the division directly opposite Tai Sui Grand Duke, which for 2016 is northeast. You should treat this area the same as the other annual afflictions with no ground-breaking work, renovations or any noisy activities. If disturbed this area can and normally will cause immediate health problems especially for the youngest male, so please be very careful. Traditionally to appease Sui Po in a Monkey year you need to display a Yi Fan Feng Shun talisman which we have included in all of our 2016 Cures and Enhancers Kits. If you have to carry out work or emergency repairs in the northeast place a six hollow metal rod wind chime between the buildings and where the work is being carried out and ideally you should contact a professional Feng Shui Master or Practitioner to select an auspicious date to start the work or consult our Tong Shu date selection software. As we entered period 8 (4th February 2004) the use of water outside is critical up until 2024, a pond/water feature positioned outside in the correct area can really work in your favour although you should not site a pond/water feature unless advised by professional Feng Shui consultant, you can however, safely place water outside in the southwest up until 2024. Outside water can be placed in the southwest or east as this is your primary and secondary wealth areas for the next twelve years. In 2016 water outside in the southwest is good but please only do so if you know what your natal chart (flying star chart) and you also have a good facing star this would make a very powerful combination for wealth. If you do not know the layout of your natal chart or do not know how to create one take a look at our Feng Shui software as it does all the work for you. If you have to use indoor water the best area is in the southwest as this activates the auspicious #8 star and is also at home in the natural element of water in the east. Regardless though it is better to seek professional advice before placing any water feature inside or out as in Feng Shui it is the catalyst to good and bad so please take care and consult or use our software. If you are using water inside or outside you must make sure the water is clean and flowing and never allow it to become stagnant as this can cause Qi to become Yin energy. Water is a very powerful enhancer and is the essence of Feng Shui (Shui meaning water) the qi is caught by the water and cleansed (providing the water is clean) and distributed throughout your property. 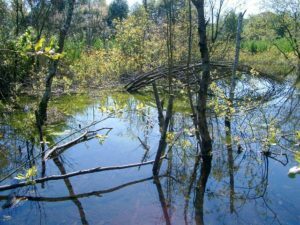 If you look on our resource pages you will find more detailed information on water placement for 2016 and beyond. Whilst the methods above are considered safe, there are many exceptions to the placement of water and as Master Practitioners and teachers we use many more methods of water placement for wealth, education and relationship, these methods whilst extremely powerful can only be used with expert guidance and a full analysis of your property and land formations, please visit this link for more details of a consultation or home/business visit. Salt water cure after just 4 weeks. Every year we receive thousands of e-mails saying how the salt water cure changed the energy in their home for the better; the Salt Water Cure is a very powerful and little known cure and one that we have been using for over twenty years. You should use the salt water cure this year as of February 4th 2016 in the northeast & centre (DO NOT REUSE LAST YEARS SALT WATER CURE). There are many exceptions to be made, the thing to remember with flying stars is, if you have a 5 yellow in a dining room and if it is an open plan home the 5 yellow’s power can drift into any other part of the home, think of perfume, if you sprayed some in your bedroom your partner may still be able to smell it downstairs because the smell goes into the air (Ch’i) and drifts around the home, so as general advice it is better to cure than leave to chance. Avoiding a room is good although I would still place the necessary cures and enhancers as this will weaken or rid the effects of the negative Flying Star and will lessen the chance of the influence spreading from the area. How do I dispose of my old salt water cure? You should always change your salt water cure every year at the least. This is because they store an enormous amount of negative energy and moving it causes problems in all parts of a building. The best way to dispose of your old Salt Water Cure is to get a Tupperware type container (margarine tub etc) and place the entire contents which consist of salt, water, glass and coins into the container. You then close and seal the lid and throw straight into an outside bin. If you do not have a container to use, you can pour the water down an outside drain (one at the back of house that leads away from the building) and place the salt/glass and coins into a plastic bag and place in bin. Please do not try and recycle, it is not worth it, this is the main reason we sell ours so cheap to make sure people can easily and cheaply renew them. Please do not get tempted to salvage the I-Ching Chinese coins as these will have stored a lot of negative Qi throughout its use in your home or office. Last year I saw a few websites selling these for 4-5 times as much as us. 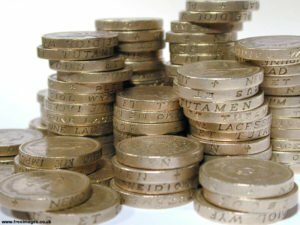 As with all our products they are cleansed of all negative energy and empowered with positive energy and the coins also come from a good dynasty making them even more effective. 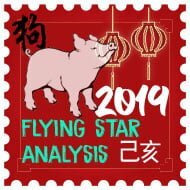 The analysis of the annual flying stars can only be conducted from a general point of view offering indications as to the potential influences of the stars in the respective palaces for the year of the Monkey. How each area affects the wealth and health aspects of the residents depends vastly on the quality and combination of the ‘facing’ and ‘sitting’ stars of the property’s natal chart and we cannot account for this in the report below. If you have had a consultation by Master Michael, he will be able to advise you better for 2016 or if you use our Feng Shui software it will show you where all your wealth, relationship, career areas are as you could have at the very least two wealth areas and maybe as many as five. Please be sure to read all of the report below as you will need to make the most of 2016; it may appear that the year of the Monkey will not be a great year and there will certainly be obstacles to overcome but by reading the information below, you can avoid and weaken many of the problems that could come your way in 2016. 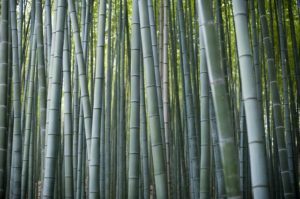 If you would like to know more about what the year of the Monkey has in store for you on a more personal level, I would consider looking at the 2016 Feng Shui Guide Or our Feng Shui online report. The southwest is very auspicious for wealth and if you placed a lottery ticket in the southwest in 2016, you will greatly increase your chances of winning. The lottery ticket below was created with an individual’s own unique lottery numbers with our Feng Shui software and taken from their birth date and just by placing it in the southwest or southeast can increase the chances of a win tremendously. If you own the software you increase your chances even more as it calculates even more advanced formulas to tapping into wealth and good luck. Please click on the the relevant area to find out more about the Flying star for 2016. Can you help me figure out where to place a little music box? We love hearing it play, but not sure where it needs to go. Currently if I overlay the grid on our floor plan it is on the line near the center and northwest areas. Our house faces Southwest. I know this year many areas need to be kept quiet but just not sure where to put the little music box. I would place them in the southeast or southwest of the home or even the same areas within a room. My mom has been experiencing a lot of health issues with her knee and legs. Her bedroom is in the northwest and our house faces the east. What are some cures I can do? I would recommend trying to keep your mothers room as calm and quiet when possible. You can also introduce a lamp beside the bed and try to keep it on when possible as this will help calm the negative energy of this area. From the 7th July to the 6th August, I would recommend introducing red colours in to this room as this will help. Good Cures to place in this area for the year are a Long Zhui Zhenzhu coiled Dragon statue and a Long Yu Quan Bi Talisman. I hope this helps, Brian and hope your mothers issues get better. 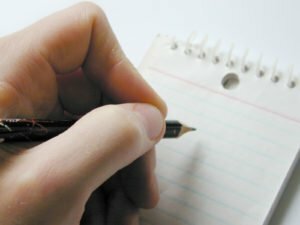 I live reading all your information and I am trying to follow your advice as much as possible. My mom has been suffering a lot of health issues this year with her knee/legs. Her bedroom is in the northwest sector of our house. What can I do for her? Also, our house faces east and we have a back patio door that faces west. What do you recommend I buy for cures? What should I do if my bathroom is in the SE? I would recommend activating the area with the cures and suggestions listed here: http://www.fengshuiweb.co.uk/advice/flyingstars2016/1star.htm as this will help have a positive influence on the home. Sounds like the salt water cure is working hard for you and best to replace ut completely. Hi! Our house is duplex type. They will be renovating the NE-E part of the right side of the house. Will us living on the left side(not renovating) be affected by the renovation? Renovation will consist of adding beams and concrete roof. Is the 6rod wind chime to be placed on the renovating part an enough cure or are there other cures needed? I suggested to move the renovation next year but my family parents insisted to do it now. Please help, thank you! I would hang the Wind Chime in the area that is being renovated as this will weaken the problems. Good luck with the work next to your home. 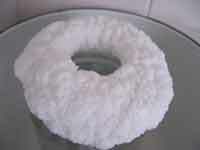 Hi, I understanding we are to avoid touching the salt water cure as it contains a lot of negative energy. But what if the water gets dirty? 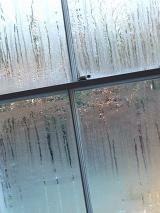 For example, in past years, I would find dust and fruit flies in the water. I\’ve been afraid to get them out, but am now wondering if I should try to keep the water clean by using tooth-picks or other tools to get the dirt out of the water. Could you please advise? I have placed the gold coloured Pi Yao from last year\’s kit in the NE facing SW and want to know if I should also place the green crystal beside it. If so, does it matter on which side? I am assuming the coin should also be placed under the Pi Yao? It is best not to disrupt the Cure although if the salt is not very formed around the top, you could use a bit of tissue paper to scoop out flies etc as long as you do not knock and split the salt around the rim. The coin should be placed under the Pi Yao with the crystal on the side. I hope this answers your questions, Linda. This article will tell you everything you need to know about the Salt Water Cure and how to set it up. 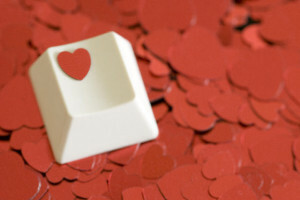 I am so happy and lucky to have read your site. 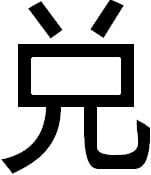 My family and I been a feng Shui believers since my first class in 1998, in Studio City, California wherein I met a lot of T.V. movie stars who also attended this class. So many women whose friends helped them with just the basics of Feng Shui changed their entire life, as it did my family. Thank you so much for the kind words. Apologies for the late reply, I have only just come across this. i have yet to place any cures in my house as I just started to look at your website. Since the best day to place cures (on 4th Feb) has passed, can I still do so? Cures can be placed at any time in the year after the 4th February and will still have great results. We have an attached garage with a door to the house. This door is side by side with the front door. Do I include the garage when I place the trigram over our property? I would attach it if there is an internal door through the house to access the garage as this would be seen as part of the house. Does this all work the same in the southern hemisphere? If not, how should I read the grid to apply the cures? Yes, the north on the grid would also be the same in all hemispheres. Can you please help me with these two issues? I bought two annual cures and enhancers kits, one for our home and the other for my husband\’s office. For my husband\’s office, I plan to place the cures and enhancers in his office room and not the whole building as the other workers may not believe in them. Do I then find out the sitting and facing directions just for his room or should I find the directions based on the whole building? The whole company is on one floor. My husband\’s office room is in the east of the building and inside his rectangular shaped room, he sits in the SE and part of the S sectors. The door to his office room is in NW. Our bedroom is in the NW of our house. We cannot move bedrooms as the alternative room is in the NE. I am very worried for my husband as he was born in the year of the tiger, so the monkey year will be challenging for him and plus the fact that our bedroom is in the NW. I will follow your instructions to place the cures for NW. In addition, can I use a red bedspread? Is that too much red? Sorry for the late response, we have been receiving a great deal of questions on here and it has taken longer than usual to reply. If your husband works around the whole building, you would be best to place the Cures around the whole office. If your husband primarily works in his own office room, you would place the Cures in this area. If possible, I would try to place them in the whole building as this will benefit co-workers although I appreciate that not everyone may be comfortable with this. The bedsheet should be fine in the northwest; I would try it out and monitor results. If the energy feels overpowering, you could take it out and use a small throw at the bottom of the bed. I hope this helps, Mei. Hi Michael, I bought 2 kits from your website one month ago. Very happy that I did it early:) My question is should I need to get or to do anything additional to ensure perfect relationship with my spouse. In your forecast for 2016 Tiger and Horse are not compatible. Please advise. Many thanks. Hi I have a small fish bowl/aqaurium in the north. My southwest corner is missing in my unit. Where should I place this water feature for 2016? Thanks so much! Another area you could place your water feature in 2016 is in the southeast. Hello! I am from the Phiippines. I am interested to buy your kit, how mush does this cost and how will I order this from you. Thank you very much. We ship worldwide and this will all be calculated through the checkout process. My bathroom room is in the south and kitchen in the southwest. Is it alright to place my enhancers in these area in 2016? These rooms are fine to place Cures and it is good that these areas are not used as much as a bedroom or living room for example. I have a patio in the northwest and a garage in the northeast,should I include them when placing my cures? I would not include them unless they are directly in your property e.g. the garage is under a bedroom.